The Grondines and Sainte-Anne-de-la-Pérade swamp is one of the last, large, treed swamps on the river. It extends along seven kilometres of shoreline in the St. Lawrence River’s freshwater estuary. The swamp shelters several at-risk species, including plants that are endemic to the freshwater estuary. It is a rare biodiversity hot spot on a global scale, according to the Atlas de la biodiversité du Québec (Quebec biodiversity atlas). Indeed, conserving this intertidal zone helps protect numerous colonies of Victorin’s water-hemlock and Parker’s pipewort. These two plants are designated as threatened under the Quebec Act Respecting Threatened or Vulnerable Species (ARTVS). They are found exclusively in the St. Lawrence River’s estuary. Both make the Grondines swamp unique. The Nature Conservancy of Canada (NCC) has conserved 90 acres (37 hectares) here. The conserved area includes large floodplain forest and an intertidal zone, part of which is officially designated as a Waterfowl Gathering Area (WGA). The diversity and number of birds that frequent the area’s agricultural, forest and coastal lands are impressive — more than 100 bird species have been recorded in the area. 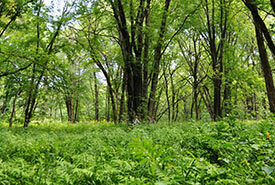 NCC has been helping conserve this exceptional area since 2008. NCC staff are currently conducting a restoration and enhancement project here. An area of fallow land within a protected property will be returned to its natural state, respecting the unique ecological integrity of the area. In two years, 2,500 trees have been planted on the edge of newly developed basins to promote biodiversity. 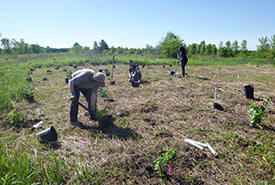 Silver maple, butternut, red ash, common elderberry, balsam poplar, eastern cottonwood, dogwood and cranberry viburnum are some of the indigenous plants that have been used to reforest this exceptional natural environment. The project also aims to raise awareness among the local community about the richness of this environment and the many ways it can be protected. NCC has conserved this area thanks to the generous contributions of the Government of Canada, through the Natural Areas Conservation Program, the Fondation de la faune du Québec, the Quebec Ministère du Développement durable, de l’Environnement et des Parcs, the Earth Rangers program, the U. S. Fish and Wildlife Service and private donors. The restoration work is made possible by financial support from the Fondation Hydro Québec pour l’environnement, with the participation of Environment and Climate Change Canada and the U. S. Fish and Wildlife Service, as well as the Alcoa Sustainable Communities Fund.